Outline | Rikugien Gardens | Let's go to the Gardens. This strolling, mountain and pond-style garden was created based on the theme of Waka poetry in the 15th year of the Genroku Period (1702) by the shogun, Tokugawa Tsunayoshi's trusted confidante Yanagisawa Yoshiyasu. 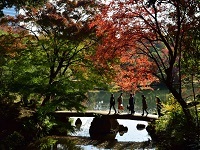 This garden is a typical example of the famous gardens of Edo Period. In the Meiji Period, this garden became a second residence of the founder of Mitsubishi, Iwasaki Yataro. Later, in the 13th year of Showa (1938), the Iwasaki family donated this garden to the City of Tokyo, and in Showa 28 (1953) it was designated as a special site of exceptional beauty and an important cultural asset. The name "Rikugien" refers to a system for dividing Chinese poetry into six categories. This system also influenced the division of Japanese Waka poetry as well. Although the number six is usually read "roku," in the case of the garden's name, it is pronounced "riku" in keeping with the Chinese pronunciation of the word.